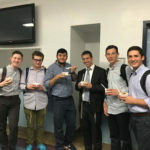 Talmidim enjoyed pre-Mishmar kugel and chulent on Thursday, October 4th, to kick off a meaningful evening of learning. The Beis Medrash was filled with the beautiful sounds of Torah learning during Mishmar, as talmidim learned Seder Nezikin mishnayos together in preparation for a yeshiva-wide Siyum on Monday, October 8th, in memory of Ari Fuld (‘91), HY”D. The Siyum is part of our Hachnasas Sefer Torah, which will include a D’var Torah from Yeshiva University President Rabbi Dr. Ari Berman (‘87), dancing the new Torah from the 185th Street Plaza into the MTA Beis Medrash, and a Seudas Mitzvah.